What does gentrification smell like? Lavender, coffee, cocoa, and vanilla, says former LADOT artist-in-residence Alan Nakagawa. 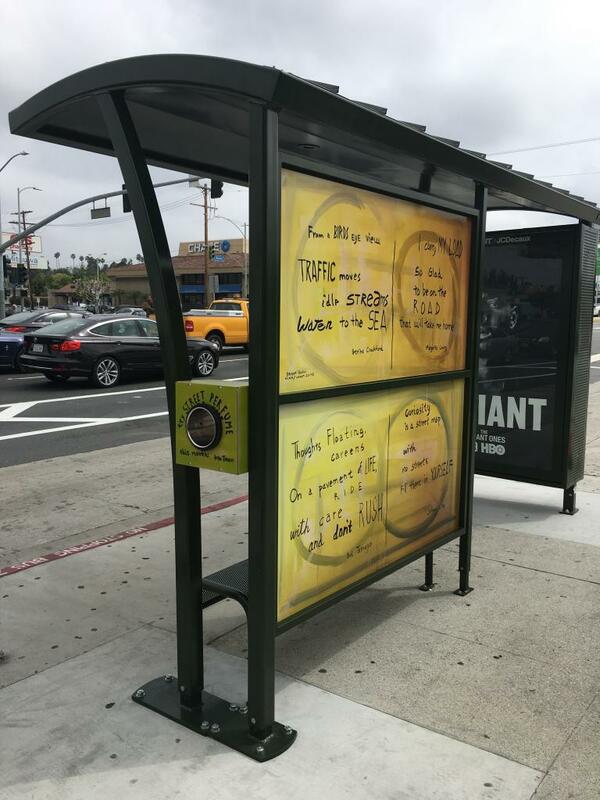 He created “Economic Development” — a scent inspired by our city’s rapidly changing neighborhoods — as part of his ongoing “perfume bus stop” project, which has been spritzing curious passers-by with Nakagawa’s custom “street perfumes” since June. Nakagawa developed the piece as part of his work with the city’s Vision Zero initiative, which aims to eliminate L.A. traffic deaths by 2025. When he was awarded the DCA Creative Catalyst residency in June of 2016, his main goal was to inspire a shift in perspective — if he could help Angelenos envision their streets differently, he thought, it might make them more willing to accept the sometimes controversial changes that Vision Zero proposes, like road diets and protected bike lanes. Walking around downtown one day, he caught a whiff of inspiration. Nakagawa spent several months hand-crafting his perfumes at a tiny Chinatown non-profit called The Institute for Art and Olfaction. There, he discovered that he could use his past experience as a sound artist to inform the way he blended smells. But according to Nakagawa, the real key to making a powerful scent is connecting it with a memory. This month’s perfume, “Hollywood in Springtime,” is the final, and most nostalgic blend in the series. Lacking a base note, it was crafted to be intentionally forgettable — much like the indistinct seasons of his Los Angeles childhood. Nakagawa’s LADOT residency wrapped up in June, but you can still grab a dab of “Hollywood in Springtime” through the end of September. If you want to see more of Nakagawa’s work, he’ll be leading a bike tour of his Street Haiku project next month — riders will meet in Mariachi Plaza on September 10th at 8 a.m.